How to prepare your chicken yard for winter: make a deep litter taco! Chicken yard . . .deep litter taco? What in the world—?? Bear with me, Gentle Reader. This is great information for you, trust me on this. For all of us. For the world. Valuable. Timely. And so on. Mostly if you have chickens in your backyard, and even if you don’t. Even if you merely have chicken aspirations at present. And who wouldn’t?? I mean, really. Chickens are so awesome. Who wouldn’t have chicken aspirations, after all? Chickens are so awesome. Clearly. Newsflash: I’m pretty tender-hearted where my chooks are concerned. You’ve probably guessed that by now, though. After all, anybody who would spend most of a day trying to get her hen to vomit to save her life (Well. It worked.) could be construed as a tender-hearted person. As a matter of fact . . . a couple of days ago, when I noticed that the o’er-amorous (ahem) attentions of my superfluous roosters (until that day, we called them “The Idiot Quads” but afterwards, I renamed them all Bone Broth: Bone Broth 1, Bone Broth 2, and so on. . . ) had bloodied one of my very favorite little hens (“Butterscotch,” a petite Buff Orpington bantam), it pretty much ruined my entire day. I found my little Butterscotch–on a nice day, too–hanging out in the coop all by herself, feathers missing, scabs on her back, trembling, disheveled, ill at ease–for good reason, too. Poor little hen! I watched her for a few minutes, wondering what-in-the-world? She clearly wanted to go outside with her friends, where the feed and water was, too, but when she hopped up to the back door and stuck her beak out the door, tentatively, daintily . . . then the trouble would start. Those Idiot Bone Broth fellows would drop whatever mischief they were involved in outside (giving wedgies to the smaller roosters, drawing moustaches on political ads and whatnot), and make a mad dash straight to Butterscotch. “There she is, guys, let’s get ‘er! !” The first one to the terrified little hen would jump on her, and then the other three would follow suit. They’d continue to squabble over her until I came running with a pitchfork to break up the lustful brawl. But wait, hear me out. Butterscotch is only 8″ tall, if that, and those BB fellows are all big, strapping, full-grown regular-sized roosters. Pshaw!! Can you see why I was so disgusted? I hate a bully, and I hate four bullies working in tandem even more. The crazy thing was: at that moment in time, there were only about 35 other hens standing idly by, most of them plump and placid and full-sized, so why did they pick on tiny little Butterscotch? I can only guess. But anyway. Those fellows are going in the freezer in just a couple of days, so they won’t be ruining my day–or any more of poor Butterscotch’s days, either–much longer. So back to the tender-hearted thing: it’s a blessing and a curse, isn’t it? The blessing is that I’ll go to great lengths to make sure my chickens are comfortable out in their coop, especially with winter coming. The curse is that if I fail, and I know that they are suffering, I’ll lie awake and worry about them. Literally–lie awake. Yes, I will lose sleep over my chickens. On to the topic at hand. One thing I really enjoy about fall gardening and yard clean-up is making my chicken yard deep litter taco. Gosh, I can’t figure out what to call it: deep litter burrito? Deep litter tostada? Deep litter open-faced sammage? Deep litter super-nachos? Oooh! Deep-litter Better-than-Robert-Redford dessert?? Something with lots of layers . . . .
During the growing season, weeds and small sticks and garden refuse and grass clippings go into my dearly beloved compost pile by way of, you know, my trusty wheelbarrow. But in the fall, my compost pile is o’erfull, and I start to haul all that goodness to the chicken yard. And believe me, I’m smiling the entire time, especially since I discovered the wonders of sprouting grains. . . . not to mention the incredible surprise of the secretly sprouting grains! You’ll have to click on those links to remind yourself of all that excitement, though. Also quite satisfying is letting my flock do my work for me, in making a nice supply of compost for my spring garden. However is all this accomplished at once, you’re wondering? Are you dizzy yet, or are you following my train of thought? Forgive me. I’m getting so excited thinking about it all, I’m rapidly losing my coherencey . . . corehncy. . . ability to be understood. I keep a deep litter in my coop year-round, and the chickens continually add to it, scratching and fluffing and finding all sorts of things to eat in it. It becomes a perfect soil amendment, after months of degradation, and believe it or not–as long as it doesn’t get deep wet spots it doesn’t smell. And speaking of great books to read, I’m reading this one right now by Mr. Salatin and . . . you need to read it too, Gentle Reader. I think you’d LOVE it. I do, at least so far. Every time I sit down to read this book for even just a few minutes, I get up with my head spinning (not literally) with all sorts of new/old ideas. I’ll write a review on it when I’m finished. But you could just skip my review and read the book! Your head really ought to be spinning, too, in my opinion. Everybody ought to read it, I can say that right now, before even finishing it. Joel Salatin is a forthright fellow, and a very successful farmer, and he calls himself a “lunatic farmer” so of course I know I’d like him. But be careful–this book could change your life. But back to our deep litter and hopefully–finally–to the Subject At Hand: the deep litter lasagna pile! 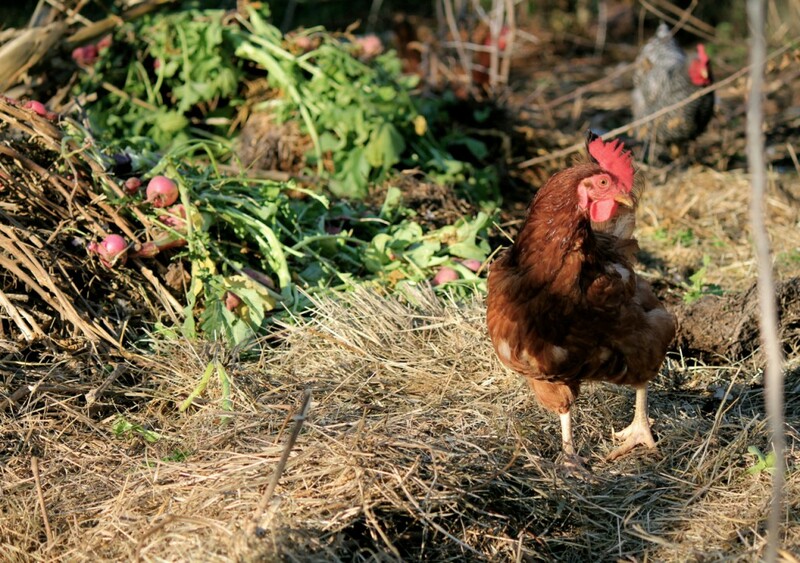 As in the compost heap, ammonia production in your coop (or yard) signals a decomposition process out of balance. I layer dry leaves (oak leaves, I think, are the best, in my experience, although most leaves work well) with grass clippings, hay, straw, even wood chips in the coop. Now and then I stuff fresh bedding in the egg boxes so the eggs have a chance at being clean when I pick them up. That’s about how fancy I get in the coop with bedding. About twice a year, I scoop out about half the bedding and use it in the garden, for fertilizing heavy feeders like asparagus and tomatoes and rhubarb, or I give it to my mom (who does the same) or I add it to my compost pile to heat it up. I love the stuff. So does my mom. So do both our gardens. So should everybody. So should you. Deep litter, basically, is awesome stuff, and it’s easy to maintain: the chickens do nearly all the work of making it into compost! And I’m a BIG fan of delegating any many chores as possible, as you might imagine. Okay. Now here’s the really cool thing: you can let your chickens do the same magic trick out in their yard, by building a chicken yard taco. Or burrito. Or what-have-you. A multi-layered mountain of refuse and organic matter, which the chickens will spend the best parts of their day in, scratching and rooting and eating and grinning like crazy. I don’t confine my chooks to their yard--they have free-range of our place much of the time–but in the winter, the colder weather does keep them closer to the coop. Once there’s snow on the ground, they will venture out of their coop, but only just. It’s not like there are grasshoppers or crickets or worms or weeds or other goodies outside the yard to snap up when the world is frozen, you know. But. 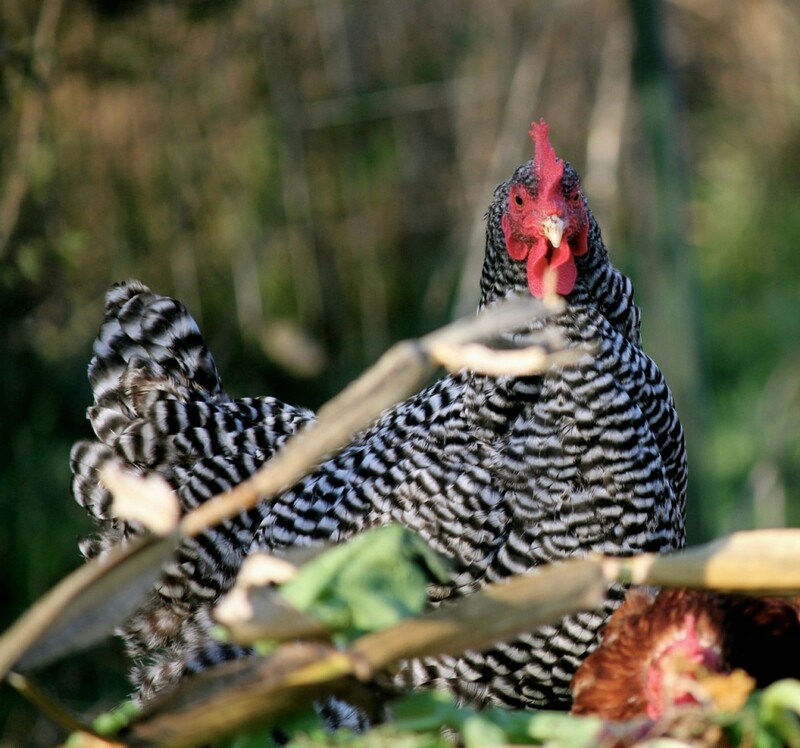 You can make sure that your chooks have plenty of good things to eat by augmenting their yard with a pile of layered organic matter. 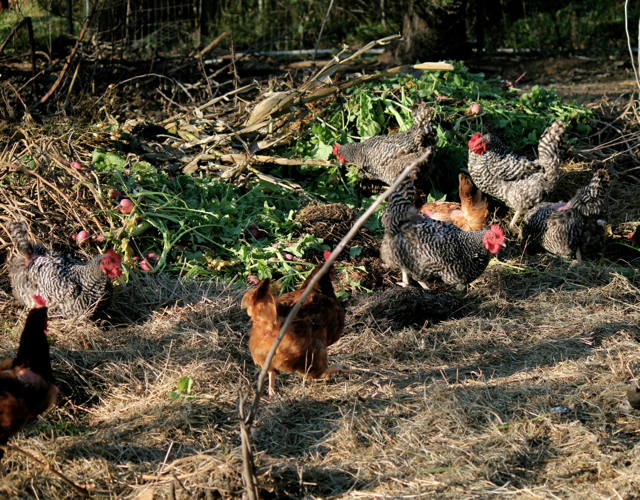 Believe me, a flock of chickens can make short work of a pile of grass, hay, leaves, sticks, and garden refuse. They will peck and scratch and find things to eat in there–I’m still not quite sure what–and if you have a high enough pile, there will be bugs and other little critters underneath that they will dig up and eat. Basically you want to avoid a bare, hard yard during the winter. You want crumbliness and diggability and all this organic matter will give you that. 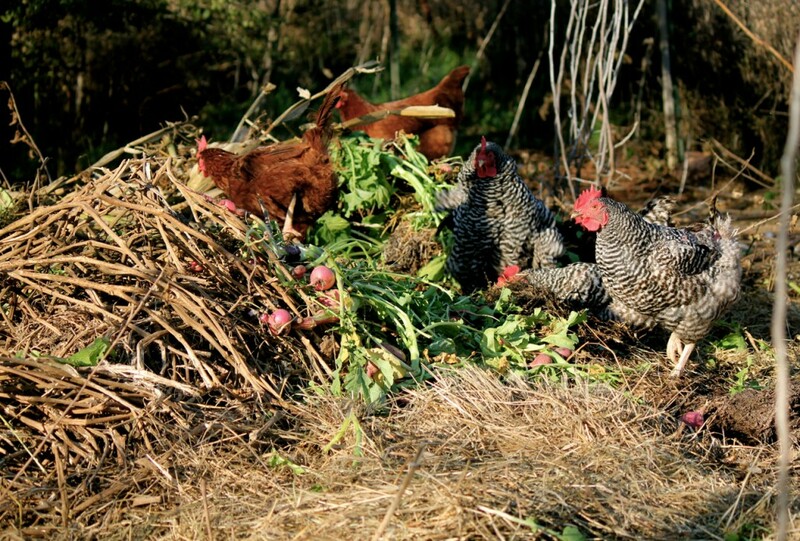 Underneath that pile, nature is making food for your chickens–food that you don’t have to buy or lug home from the store! Actually, probably better food than you can lug home from the farm store. Are you sold yet on making a deep litter tostada for your chicken yard? It’s easy to do. 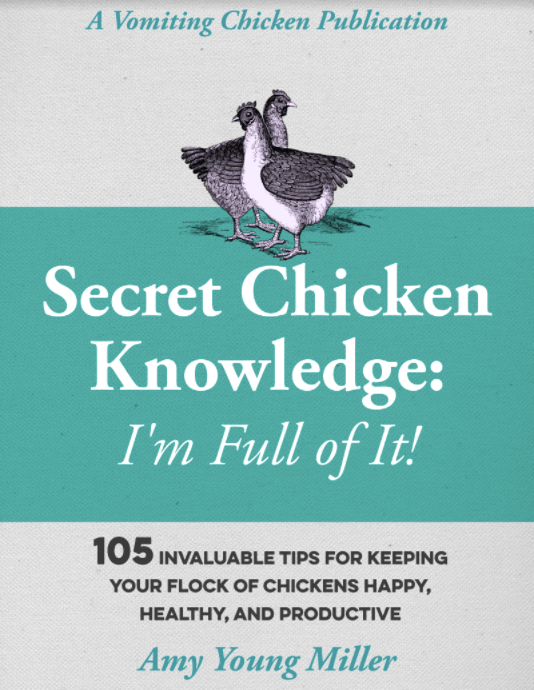 I can guarantee that if your chickens were reading this over your shoulder, they’d be nodding and exchanging excited glances and nudging you gently on. “Do it–do it–do it–do it! !” That’s what they would be saying. Here’s how I do it: in the fall, when I’m cleaning up my garden and yard, first I scatter plenty of (untreated, and unheated) grain on the ground in the chicken yard. If I have any old pieces of cardboard, I’ll put it on top of the grain. On top of this, I pile lots of garden and yard refuse: weeds. 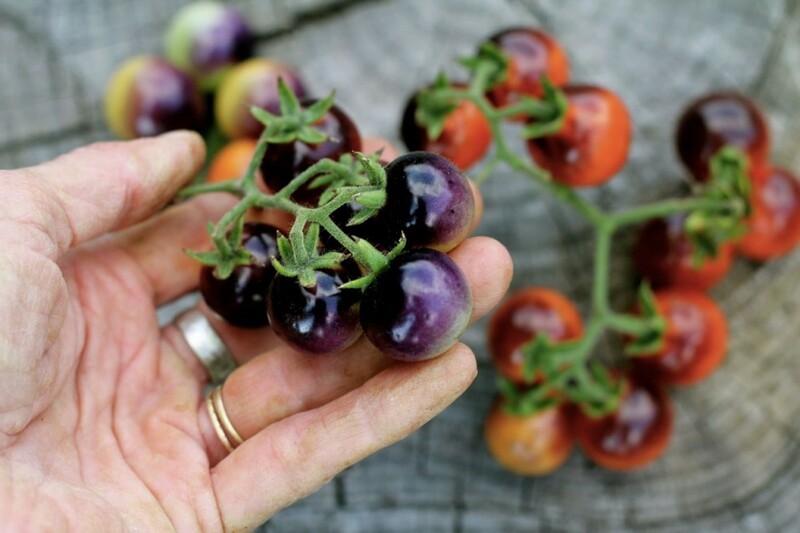 Tomato vines. Spent plants from the garden. Orchard trimmings. One thing I do not include: thorny trimmings from the locust trees or rose bushes. I don’t want my chooks to harm their feet, after all. Once I’ve got a nice big pile (you’d be surprised at how a flock will decimate it, over time) I heap grass clippings and/or a couple bales of hay and/as many leaves as I can get my hands on, on top of it all. By the time I’m finished, I have quite a big pile! And that, of course, is what I want. Now, whenever I got out to feed the chooks, I toss some of their scraps and also some of the grain that I feed them every day, on top of that pile. Not all of it, but some of it. So they’ll start scratching in it right away, to get at the good stuff. And they’ll scratch in it every blessed day this winter, except for those few days when there are inches of snow or ice on top of the pile. By spring, they will have made the nicest, fluffiest garden amendment that you can imagine. My chickens do so much work for me! And yours could do some great things for you, too. 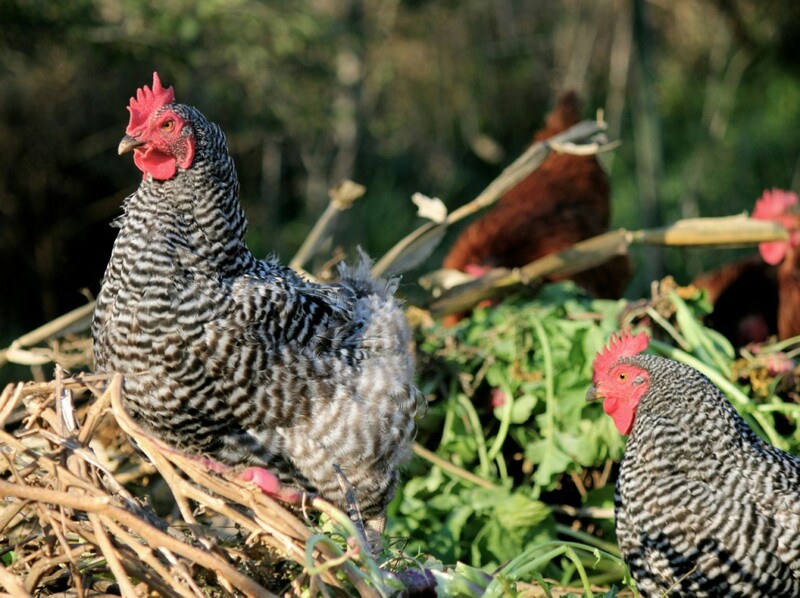 * “Surprising Chickens: Bobbing for corn on the cob, and winter feeding tips” <—–this one’s fun! and also . . .
By the way. I’m opening a shop soon, and this is what will be in it: rolling pins made by my Dad. Pretty sweet, hmm? ← A Fine Kettle of Turnip Greens: How to Freeze ’em, Already! Thanks for this tutorial, ‘ll be sure to do this when I et my chickens. Your Bone Broth team reminded me so much of a banty rooster we had on our acre growing up. Seems he took a major dislike toward me, and would attack every chance he had. It got to the point where I feared the daily egg-gathering chore. But one day, I was home alone and had little choice. So I took the handle of a shovel with me for defense. It may sound cruel, but this guy was getting the best of me. Well… he came at me, I took a swing… and I kid you not.. I broke that shovel handle in half as it sent the bird flying through the air. I watched him sail through the air, land, get up, shake it off… and come at me again. A week later he ended up in our freezer. It was of little surprise that his meat was tougher than all get out! OH MARY, we’ve had similar things happen with mean roosters at our place. We don’t allow them to boss people around for long, though. They can be downright dangerous, with their spurs and their fearlessness. Bah on them, say I! I am SO passing this along to my neighbour who recently decided to take 4 chickens on as pets in her backyard! Great read! Thanks! Great information! Thanks for sharing how to prepare your chicken yard for winter 🙂 Nice tips and fantastic pics! Just what I need. Thank you for the tips. I can’t wait until Thanksgiving. Great post! I’m not zoned for chickens where I live, but I would love to have some. I also want a pitch fork like yours! Barbara, I think I picked it up at a farm sale, go figure . . .
Awww, I LOVE that you love your chickens!!! I’m a huge animal lover and I would also lie awake if I knew my babies were cold and/or unhappy! Great idea, Elly, really, I appreciate the suggestion! I love your posts! They are so witty and chuck full of information. P.S. 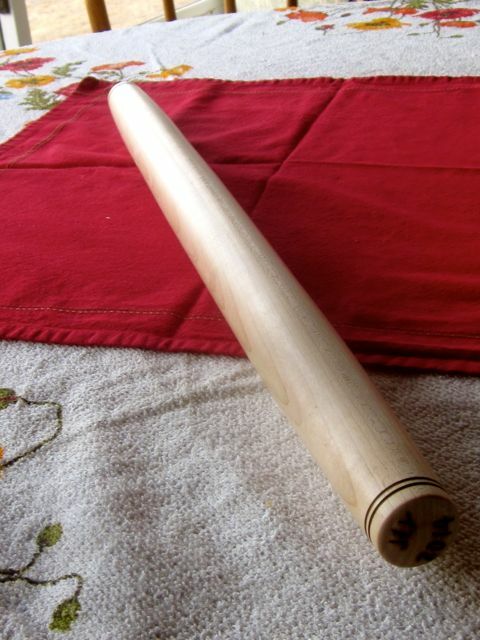 I would love a new rolling pin. Mine is cracked along the grain which makes my pie crusts have a ridge in them. Poor Butterscotch. Her saga reminds me of when we owned chickens, nearly 30 years ago. 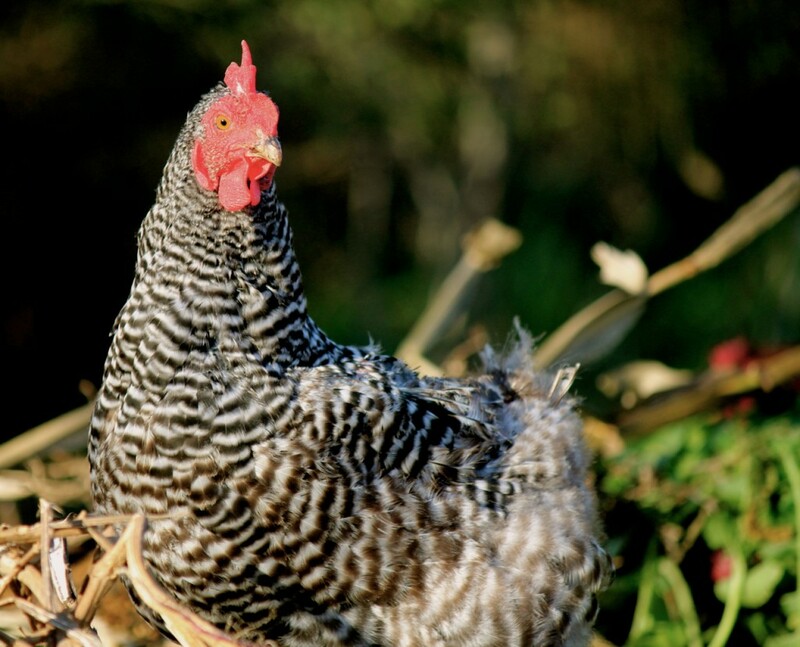 There was one rooster who was the barnyard bully and dared to attach spouse, putting a spur in his calf. After that the bully was named Chicken Crowquette. Before he could make this threat come true, we found the bully cowering behind a feed bin. The other roosters had gotten fed up with his antics. Mr. Chicken Crowquette met his fate the following day, and yes, he made a pretty delicious (if not tough) croquette. Amy, I love reading your stories! You have an engaging writing style! Your chickens are so pretty, too. Unlike you, I really don’t know much about them, so I had no idea there were so many different kinds of chickens with such brilliant colors and markings. I will have to share this post the next time I see someone writing about caring for chickens. By the way, did you ever figure out why the bullies were picking on poor little Butterscotch? Is she OK now? That sounds perfect, Stacie. Have you, by any chance, read any Joel Salatin? I love this idea of keeping the coop and area but I live in northern Wisconsin where we can get 15″ of snow in one day — thinking all that wonderful straw, leaves etc for the chicks to scratch around in would be buried . . . anyone else from Wisconsin and what/how do you approach this? Thanks! I am a newbie, first year with chickens, have 12 meat chicks, 5 hens 2 roosters (mistake by where we got them), 2 turkeys and 2 ducks. We plan to bless and process to my pantry the 12 meat chicks in 3 weeks, either give away or process our duckies because it’s too much wetness with winter coming up. We were going to have the turkeys for the holidays but my husband is getting so attached to them they may be guests rather than dinner! So for over the winter we will have 7 birds possibly the turkeys. Any tips would be greatly appreciated! Hi Carolyn! You raise a very interesting question (about what to do with the chicken yard in deep snow areas) and I will post it in my vomitingchicken Facebook page- (https://www.facebook.com/vomitingchicken?fref=ts) so you might want to follow along, if you’re on Facebook. Here are my recommendations, for what it’s worth: First, I’d process one of those roos with the meat chickens. Two roos with 5 hens is a very roo-heavy proportion, and by winter’s end the hens are going to be in poor shape, poor things. Then I’d erect some sort of a shelter against the snow–think a sheet of plywood leaned up against the coop? and anchored with t-posts?–and build your deep litter in there. 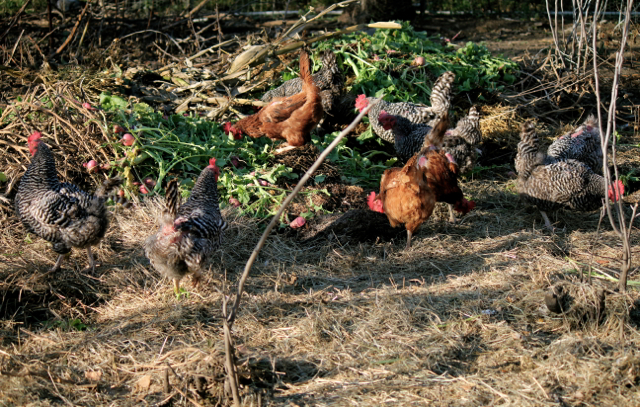 With only 6 chickens, even just a tiny bit of yard will be wonderful for them. We get snow, too, though very rarely 15″ at a shot. I have to scoop a path to my coop, and will even scoop an area in the yard, if necessary. The chickens will still get out in their yard if they have a path scooped for them. 😉 OR when there’s lots of snow, I’ll pile an armload of dry hay on top of the snow and the chickens come right out in it. 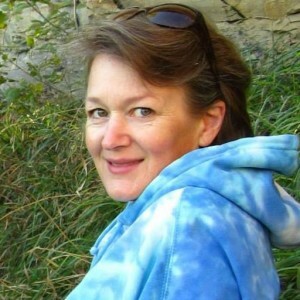 Blessings to you, Carolyn–let me know what you do! Well, I was going to just lay around on my day off today, but after reading a few of your articles I think I will be outside today. Really a much better idea since it is a beautiful day. Thanks for all your ideas and information! Lynda, good for you. You really need to be out in the sunshine soaking up that vitamin D while you can, if you’re anything like me. I miss the sunshine during the winter months, to be sure! I love it when you have had two cups of bullet proof coffee, you writing takes on a whole different twist. Taco feed for chickens that could someday become taco filling themselves. I love it. I will watch my brother in law and see what he does for his chickens for the winter but I think it is pretty much what he does for them the rest of the year, let them run around all day digging for food, then a little before sundown, tossing some corn to them to round off their meal….they sleep in trees, although they do have a coop if they wish, but most of the prefer the trees. Oh Chef, you are a diehard reader to recognize my writing when I’ve had too much coffee!! Your comment made me laugh! I think your chicken raising in Mexico is quite a bit more natural than ours here in Nebraska. Your climate allows for more free-ranging, and perhaps people aren’t so uptight about where chickens do and don’t belong. In fact my mother has always wanted a couple of hens at her place (in town) but the town rules haven’t allowed it in the past. Perhaps they do now. Hi! I’m new to the whole chicken thing and am planning to get some in the spring – i get so put off reading some chicken blogs but yours always inspires me so much! It’s matter of fact but without dumping a load of negativity on your reader- and it’s funny too! Anyway, thanks to you I’m sold on chickens! What I wanted to ask was, do you have or have ever had a problem with rats? I had heard that putting grain into deep fill encouraged rats. I’m going to deep fill my chicken yard but need no excuses for neighbours to complain! Any advice always welcome. Ali, you’ll have to clarify this phrase for me: “putting grain into deep fill.” Is that deep litter (American translation)? I’ll give you my RAT experience, free: I’ve only had trouble with rats twice. One time was when we lived in town (ironically) and the feed was going so FAST I couldn’t believe it; until I walked in one morning and saw RATS! Yuck!! I got some rat poison and put it in a shoebox, securely taped against the chooks, of course, with a rat-sized hole in the end. They cleaned it up and no more rats.